David Powers King: Random Sauce: Do You Know This Joe? Random Sauce: Do You Know This Joe? If you catch me writing new drafts or editing stuff, you'll often hear music - music without words - film scores (I find lyrics distracting)! I've amassed a collection over the years and have discovered many favorites. 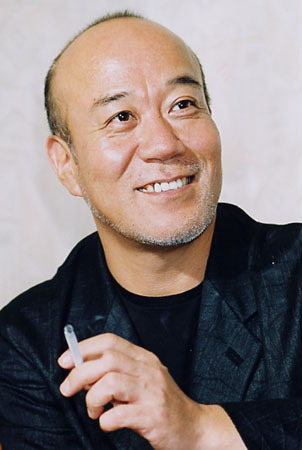 And Joe Hisaishi is high on the list. You may know his music from Studio Ghibli films (Spirited Away), but his career is rich with well over 100 scores composed. I might be so bold as to call him the John Williams of Japan. Amazing what happens when you pick up a violin at age five and decide right then what you want to do with your life. By doing so, he has since enriched many films and given inspiration to others. How can you not be moved by a piece like this? As writers, we've taken on a different kind of art, but the end goal is the same; move and inspire others. Not just us, but for anyone who happens upon your treasure. Do you listen to anything while you write? What sparks and carries your imagination at the keyboard? I'm David, and have you seen a fluffy wind monster? I always play music when I'm writing, although rarely movie scores or instrumentals. If it rocks, it's playing. Yes...I always listen to music. My current WIP has a strong Japanese alternative history backdrop, so I've been listening to the Yoshida Brothers. I've been a fan of that Joe since seeing Laputa: Castle in the Sky. I have a huge play list of contemporary songs, but I listen to a lot of classical I think because I was a big orchestra geek years ago. I don't get the chance to listen to much music. My background music is my kids running around and Dora the Explorer. Joe's music is a million times better. Beautiful David! I'm a big score listener/writer myself. Some favorites of late are A Single Man, Hugo and, although not entirely instrumental, We Bought a Zoo. I don't listen to music while I'm writing. I find it distracting. Actually I rarely listen to music anymore. There's too much going on and any quiet time I get I keep quiet. Oh I love this composer. Spirited Away had such an amazing soundtrack. Joe Hisashi! Love his work. Just the beauty of it makes me shiver. For Japanese composers, Yuki Kajiura is probably my favorite. Pretty much anyone/thing produced by her I can write to. My other go to for writing is Enigma. Best background music ever. Huge Studio Ghibli girl. At the library yesterday my son tried to get Castle in the Sky and I told him that the other kids would complain because he got it all the time. But he insisted he wanted a Totoro movie so we dug out Kiki's Delivery Service. I can't listen to music and write. I start to write "...deep sad sousaphone solo..."
Oh, I like that music. I'm going to have to see if I can find him on Playlist. Thanks for the heads up. It was nice getting to see you again at LTUE. Ha! He did the theme for Princess Mononoke! I LOVE Totoro-- and Joe's music! I listen to music just before I write. If I listen during, it distracts me too much. And I'm sorry we didn't get to say hi at LTUE, too! I'm not going to Shannon Hale's signing, but I will be at Dan Wells' on Feb. 29. I can't listen to music at all while I write... it's far too distracting. But when I do listen to music, my favorite composer is Nobuo Uematsu--he's the guy that did the first ten Final Fantasy scores, as well as being the head of the Black Mages band. :) His stuff is just fantastic. I write with music, definitely. However I don't exactly have a huge range. I love to listen to the sound track from 'How to Train Your Dragon'. Somehow that one always puts me in the writing mood. I almost always listen to music when I'm writing. It not only helps to ground me in the scene that I'm writing at the moment, but it also helps drown out all of the distractions that I might respond to otherwise, and it establishes mood even when I might not be feeling angry or sad. I find myself listening to the symphonic music that came with my copy of "The Legend of Zelda Skyward Sword" most often right now. Studio Ghibli is amazing--and I love Joe Hisaishi's music. I sometimes listen to music when I'm writing; it depends on my mood. If I do listen to it, though, it's always classical. Anything with lyrics distracts me. Oh, wow! This is a subject after my own heart! Like you, I listen to movie scores when I write. The score I always go to when I need to write inspiring or romantic words is Shakespeare In Love. I tell you, I get so wound up emotionally with that score that the words just pour out! Currently I'm listening to The Dark Knight score for my latest WIP! It's the right music for the atmosphere I'm trying to create! Gosh! I don't think I'd be able to exist without writing to music! Music plays a huge role in my writing life. As I read over my manuscript, I can remember exactly what I was listening to when I originally wrote each part. Yeah, I listen to music. 99% of the time it's film scores. My favorite composer is Steve Jablonsky, you know, The Island, all 3 Transformers. Yeah, freaking inspiring. I also love Hans Zimmer, Patrick Doyle, Alexandre Desplat, Michael Giacchino, Danny Elfman, Carter Burwell, Two Steps From Hell, and Ramin Djawadi. Wow, yeah, that was nerdy. It bugs me to write without music. I can't get into the zone, you know? Sometimes, though, the music will stop and I won't notice for a while. So music is my kick-starter. Always play music when I'm writing. I pick a CD or pandora station that matches the mood I'm going for. Many times I come up with scenes based on a song I hear. I've tagged you on my writing-blog: http://katharina-gerlach.blogspot.com/2012/02/tag-im-it.html Looking forward to your answers. BTW, the last pic is from one of my favorite movies, "Totoro". Great film.